Schaumburg, IL (March 2017) – Reliability is a key factor within the pulp and paper industry. Production stoppages are very costly and it is key to avoid these whenever possible. 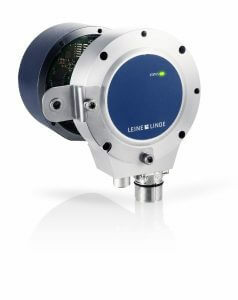 For sustained production and condition monitoring capability, Leine & Linde now offers an integrated Advanced Diagnostic System (ADS Online) which monitors the environmental and operational parameters of the encoder to establish the status of the encoder and report this information out to the system operator. This result of this Leine & Linde system is in more efficient production, as maintenance and operational personnel now have the power to plan preventative maintenance during scheduled maintenance cycles to further evaluate and replace encoders, thereby avoiding unplanned production stoppages. Leine & Linde’s 800 series of rotary encoders is already a popular solution in the pulp and paper industry. Currently they are used to regulate the speed of the rollers driving the paper forward with a high level of accuracy. These robust and accurate encoders have played a central role in such systems to this point, and now the 800 series of encoders boast the capability of integrated diagnostics in its entire line. Utilizing the new ADS Online, all these encoders can now provide additional problem-solving information. Until now, Leine & Linde’s new ADS Online capabilities had only been offered as an optional module for existing encoders. The newest versions of Leine & Linde’s 850 shaft encoder and the 861/862 hollow-shaft encoders have now incorporated this functionality as standard into the encoder foundation. For more information on these encoders, contact Jonathan Dougherty at HEIDENHAIN at 847-519-4218, or write to HEIDENHAIN Corporation, 333 E. State Parkway, Schaumburg, IL 60173.